This is a picture of the assembled cuts. Arrange 2 – 5.5″ presents side-by-side on your Cricut mat, so that the edges are touching at the top of the present (the “lid”). Choose the “weld” function so that the 2 items become 1 when cut. Cut out the image. Keeping your height at 5.5″, cut the bow. For my card, I used patterned paper from the Yuletide Carol Paper Packet for the present base, and Cranberry cardstock for the bow. 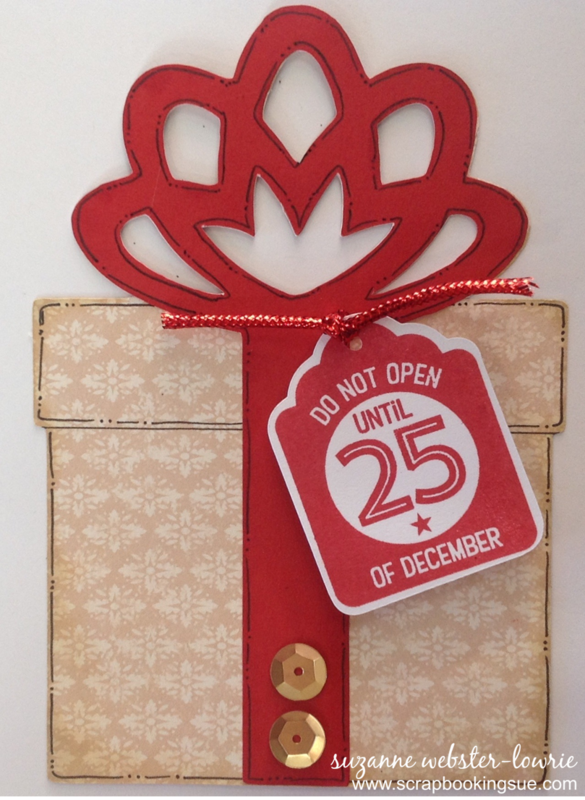 To add a bit of depth and color to the card, I used a sponge dauber to sponge Champagne ink around the edges of the Yuletide Carol paper, and Cranberry ink around the edges and centers of the bow. 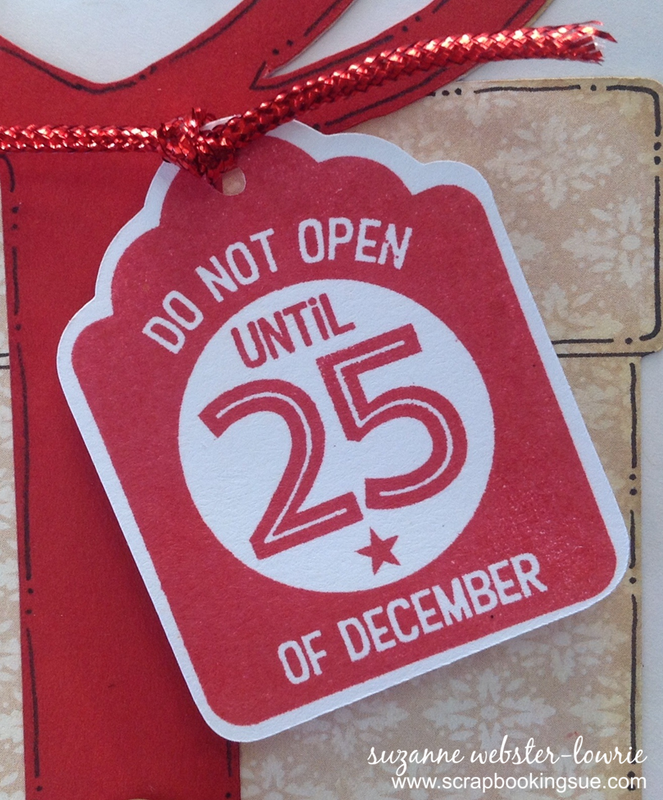 The “Do Not Open” sentiment was stamped in Cranberry ink onto White Daisy cardstock. The stamp was from the October SOTM (Stamp of the Month) set, “Home for the Holidays,” which is only available until October 31st! The tag was also cut from the Art Philosophy cartridge… the cutting size to match the stamp was printed right on the carrier sheet of the stamp set. Many of the CTMH stamps are Cricut compatible and all matching cutting sizes are listed next to the stamp for convenience. Once the tag was cut, all I had to do was line up my sentiment and stamp it! I used a black journaling pen to make some dots and dashes around the present and bow for some extra interest. 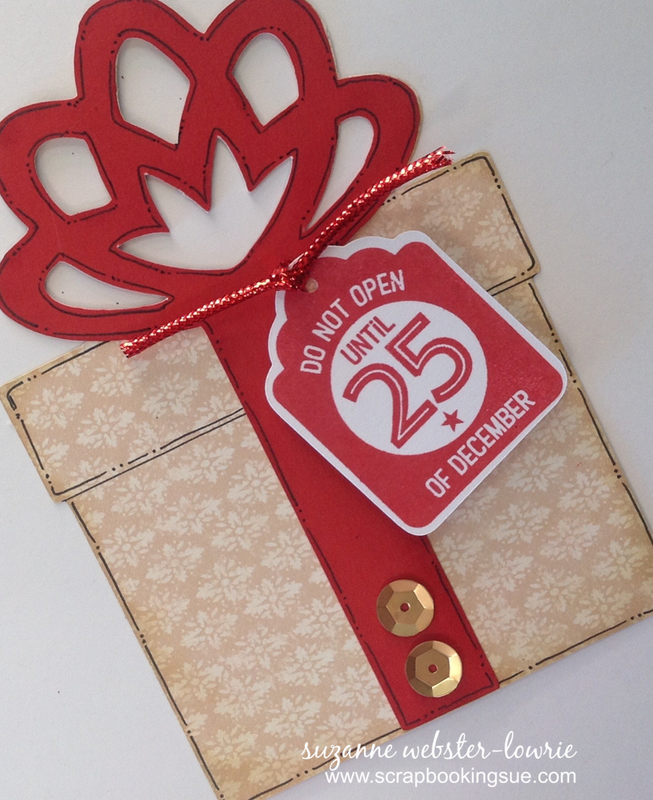 To finish off the card, I added 2 Gold Sequins to the bottom of the bow, and a piece of red stretchy cord through my sentiment tag… the exact same cord that I use on my actual Christmas presents! The cord was just tied through the tag and not glued down, as I used foam tape on the back of the tag to pop it off the present and attach it to the card. I can also envision making smaller versions of these presents (without the card back welded on) to use as tags for Christmas presents this year. How cute!